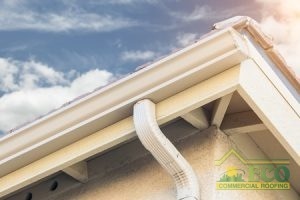 To Determine Whether Your Roof Has Begun to Lose Granules, Simply Check Your Gutters. Like any component of a house, a roof has a limited lifespan. If you have the most popular roofing material in the country, asphalt shingles, then you can expect about 20 years of dependable service. Beyond that frame of time, you may begin to notice certain signals that you need roof replacement. Pay attention to these signs, and call ECO Commercial Roofing at (833) 200-0571 should you need service in Texas or Louisiana. Your asphalt shingles have granules to protect them from impacts and the effects of the sun. If your shingles begin to lose a great quantity of these granules, you can blame either a faulty product or old age. Either way, you will need to replace your roof. Shingles devoid of their granules will quickly buckle and curl to leave your roof vulnerable to water penetration. If you require roof repair more than once a year, you need to consider the wisdom of a whole new roof. A roof that requires the frequent replacement of shingles, for example, indicates either old age or faulty materials. A roof subject to frequent repairs will also acquire an unattractive, patchwork appearance. Simple old age accounts for the most common reason for roof replacement. Once an asphalt shingle roof has aged beyond 20 years, it can fail at any time. Even a roof that appears in good condition can harbor weaknesses that will lead to failure in a major storm. To protect both your home and family, do not take chances with an old roof. For roof replacement in Texas and Louisiana, trust the experts at Eco Commercial Roofing. We are your regional experts for all matter of roof-related issues. To learn more or schedule service, give us a call today at (833) 200-0571. Posted in Uncategorized on December 14, 2017 at 5:39 pm by ECO Roofing.